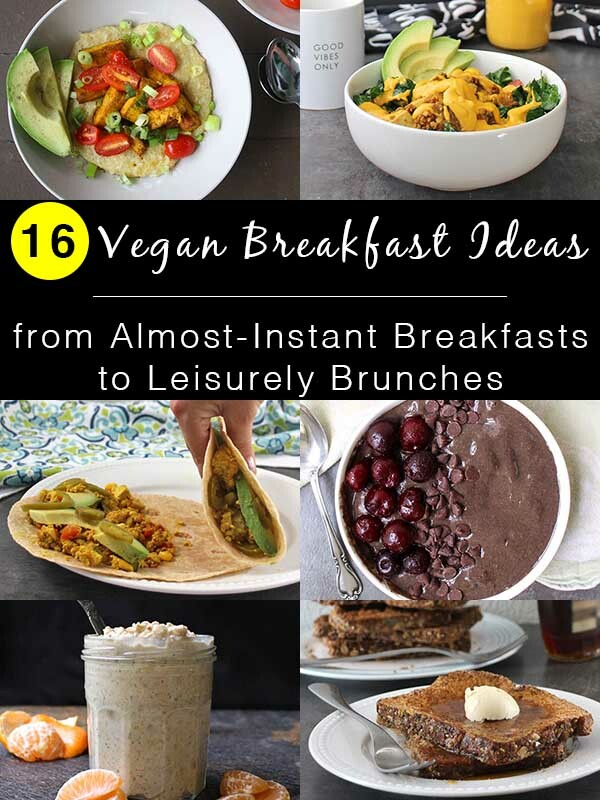 Start your morning off right with these easy vegan breakfast ideas! There’s a whole range of options, from almost-instant to a bit more time-consuming, so you can choose the vegan breakfast that fits best into your morning routine. It makes sense that folks who are new to veganism or are veg-curious have trouble coming up with vegan breakfast ideas. If you grew up eating the Standard American Diet, you are probably used to starting the day with eggs, bacon, sausage, dairy cheese, and other animal foods. The good news is that you can replace these with plant-based alternatives or mix up your mornings with something totally new. Do what makes you most comfortable! You overslept. Your kid has no idea where his second shoe has gone. You need something now, something you may have to finish eating in the car. Let’s do this. These are breakfasts that take only minutes to make or are make-ahead. Don’t roll your eyes! Toast is my family’s go-to in the mornings, because oversleeping is my second job. We usually serve our toast with “yellow butter” (aka vegan margarine) or peanut butter. But you can up your toast game in little to no time! Try cashew butter and peach preserves, sliced avocado and tomato, vegan margarine and orange marmalade, a few slices of vegan bacon, or a schmear of veggie cream cheese. You also don’t have to toast bread. There are plenty of vegan bagels, English muffins, and frozen waffles available. Just check the ingredients for eggs and milk, since some companies like to add those to breads. If toast feels a bit boring to you, spice things up with a breakfast muffin! Bake a dozen over the weekend, and you’ve got breakfasts all week long. 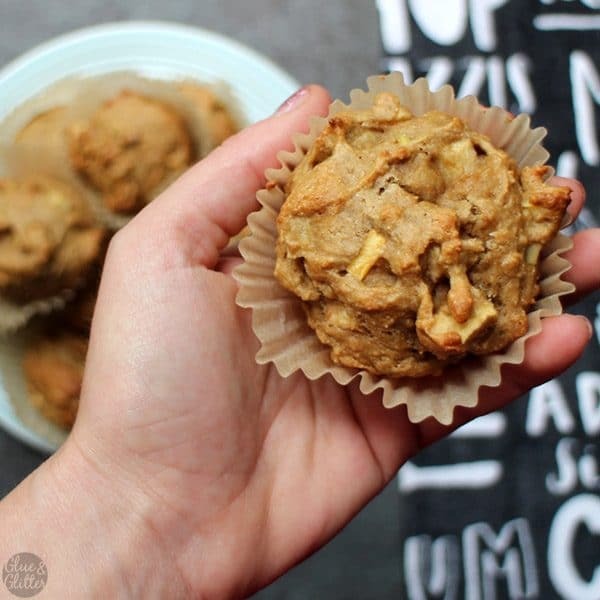 My kid has been loving Strawberry Muffins and Banana-Apple Muffins lately, and these Carrot-Ginger Muffins from Delightful Adventures have been calling my name! 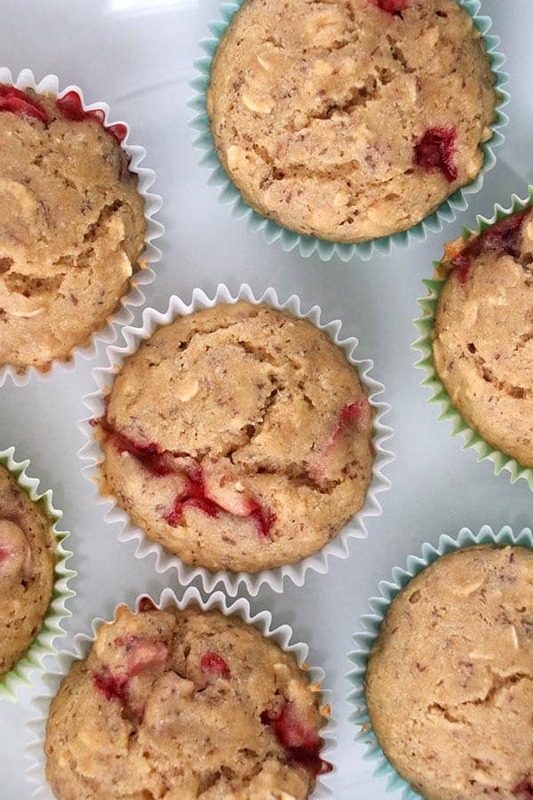 Packed with fresh strawberries and a touch of oats, these simple vegan strawberry muffins are the perfect grab-and-go breakfast or snack. adapted from Taste of Home.We’ve been making these recipes about once a week and experimenting with mix-ins! Instead of the chopped apple, we’ve really liked these with 1 – 1 1/2 cups of blueberries, 1 1/2 cups frozen cherries (not thawed), or 1 cup sliced strawberries. Darrol, my son, loves that he gets to choose each week’s muffin addition! If you hate microwaves, then this is not the quick vegan breakfast for you. But if you don’t mind the microwave, then you can have a piping hot bowl of oats in five minutes flat. Stir in nut or seed butter, fruit, vegan margarine, preserves, nuts, seeds, etc, and you’re good to go! If you have to take your oatmeal to go, just transfer it to a travel mug. Cereal and milk is the classic no-time-for-breakfast breakfast. Pour on your favorite vegan milk, and you’re ready to eat hasty spoonfuls while also trying to pack your kid’s lunch and convince him to wear shorts on a 90 degree day. If you have a spare few minutes, some mix-ins make a humble bowl of cereal a lot more special. I love adding a handful of cashews and fresh or dried fruit to make my cereal feel less like the hastily thrown together meal that it is. This is my new favorite quickie breakfast, because it’s filling and ready in two minutes. Peel a banana, and put it onto a plate with a scoop of peanut butter. Eat each banana bite with a mini peanut butter bite. If you can’t do peanut butter, any nut or seed butter will work here: sun butter, cashew butter, almond butter, etc. 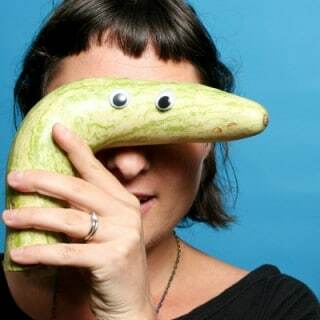 You can also do a sliced apple instead of a banana, but I’ve found that a banana keeps me feeling full for longer. I’m lumping these vegan breakfast ideas together, because they’re basically the same thing in different serving dishes. Smoothies are great when you need a breakfast that you can take with you. Just toss everything into your blender, pour it into a cup or bowl, and breakfast is served. If you add enough fiber, protein, and fat, a smoothie can keep you feeling full for a good part of the morning. I have a ton of smoothie recipes on my site (and a whole book dedicated to just smoothies!). If you have the time, sit yourself down to a beautiful smoothie bowl! A smoothie bowl is just a thick smoothie, poured into a bowl, and piled up with toppings. You can make my Chocolate Covered Cherry Smoothie Bowl or turn your favorite smoothie into a smoothie bowl. 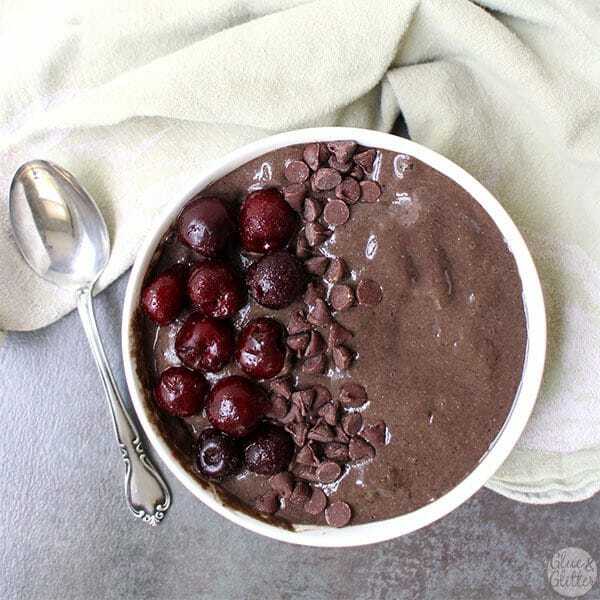 A chocolate covered cherry smoothie bowl packed with chocolate, cherries and some sneaky greens and protein. Breakfast is served! This one does take some advance planning, but with overnight oatmeal in the fridge, breakfast is ready when you are. Mix up your jar of oats the night before, and you’ve got a grab-and-go breakfast in the morning. When I’m feeling planning-y, I like to do a big batch of overnight oats, so my family can have breakfasts at our fingertips for a few days afterwards. 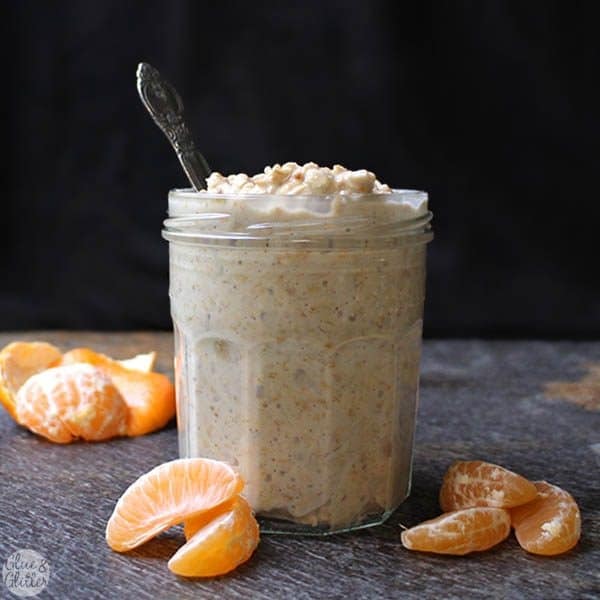 My Tangerine Creamsicle Overnight Oats are a delicious place to start. Rich and creamy creamsicle overnight oats will totally remind you of that childhood treat. And you only need five ingredients to make them! This is another vegan breakfast idea that just requires a little bit of forethought. Just mix up your ingredients the night before, and grab a jar of sweet, protein-packed chia pudding in the morning. Like overnight oats, chia pudding is super versatile! 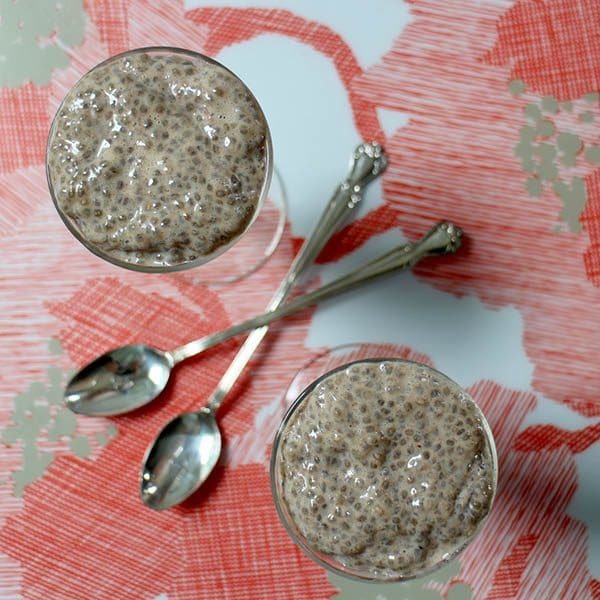 Start your day with my Chai Spiced Chia Pudding. You can also go fruity, if that’s more your thing. I developed a Strawberry-Banana Chia Pudding for Care2 that is a crowd-pleasing treat! Rich, flavorful Chia Chai Puddings are a perfect breakfast for one or dessert for two. They only take about five minutes to throw together! These are easy vegan breakfasts that take just a few more minutes of prep. But they’re still totally doable on a weekday morning! If scrambled eggs were your morning go-to, then tofu scrambles are your new best pal. The filling for these Breakfast Tacos also tastes great on its own, if you don’t want to take the time to assemble a whole taco in the morning. 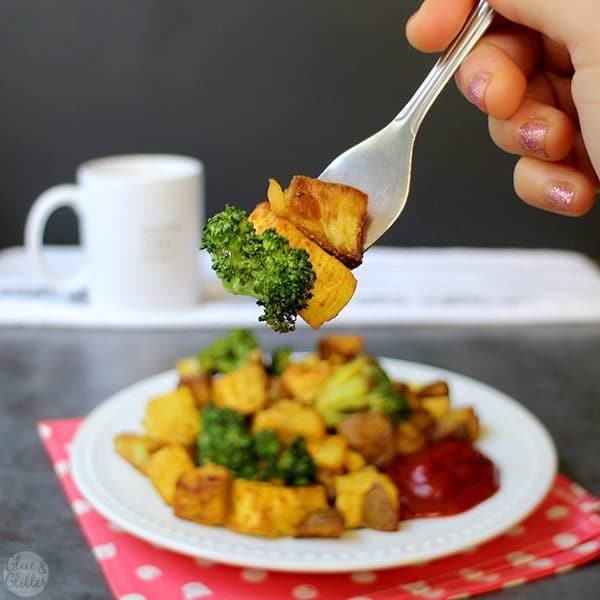 If you have an air fryer, you can also totally whip up a tofu and potato scramble right in the fryer! It takes about half an hour, but you don’t have to be there, so you can be getting ready for work and school between steps. We eat a tofu and potato scramble almost every weekend, and I’ve finally worked out how to make it happen in the air fryer! Tofu isn’t the only thing that you can scramble, either! Cadry has a super tasty recipe for a Chickpea Scramble that she serves with hash browns. Got some leftover quinoa from last night’s supper? Throw it into a pan with a few other basics to make a super healthy breakfast porridge that’s ready almost as quickly as a pot of oatmeal. 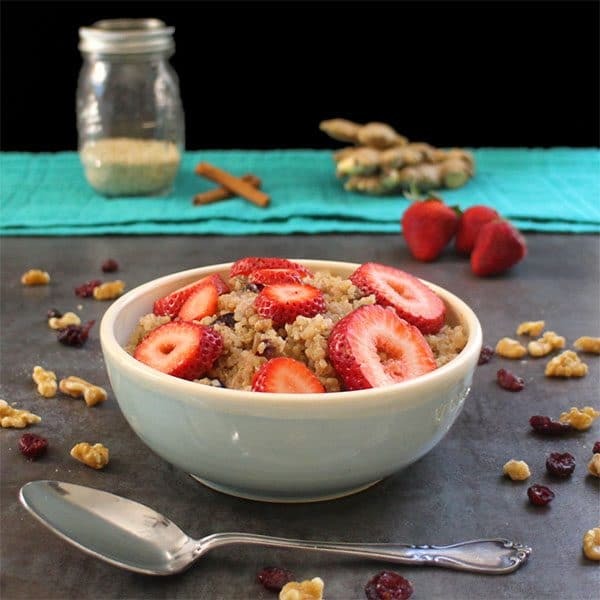 This Fruit & Nut Quinoa Breakfast Bowl is a healthy, satisfying way to start the day. Just simmer everything on the stove for a few minutes, and you’re ready to eat! What I love about a quinoa breakfast bowl is that you can really use any fruit, nuts, and seeds you like, so it’s a great breakfast option for a morning when the cupboard feels a little bit bare. While your quinoa porridge is cooking, you can brush your teeth or beg your kid to please, for the love of all that is good, FIND THAT SECOND SHOE. Pile on the vegan yogurt, granola, and fresh fruit for a breakfast parfait that feels restaurant-fancy. Amy uses a chopped up granola bar in her yogurt parfait recipe, which is a great way to use that granola bar that has been in the back of your pantry, begging to be eaten. Stuff your vegan breakfast burritos with tofu scramble, fresh veggies, avocado, and your favorite sauce. I’m also loving these Cheesy Kabocha Squash Breakfast Burritos from my buddy Kristina at Spabettie. Breakfast burritos also work well for vegan breakfast meal prep! Make a batch on Sunday, and you’ve got lunch for the week! Kristina says that you can store these wrapped in foil, then warm them up in the oven when you’re ready to eat. While the burrito is heating up, you can take a quick shower or realize that you also can’t find YOUR second shoe. Is brunch the same as breakfast? I like to think so. These recipes are perfect for a laid-back morning, when you want something a bit more elaborate. Breakfast salad? Don’t knock it ’til you try it! My kid went through a bread-hating phase (I KNOW), which is where this recipe idea was born. 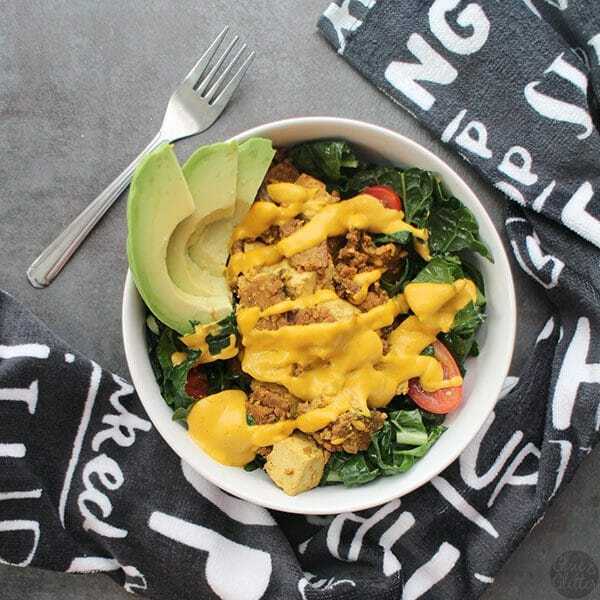 My Breakfast Kale Salad recipe is pretty elaborate, with a bacony tofu scramble and homemade vegan cheese sauce. It’s freaking amazing as-is, but you can also mix and match your breakfasty toppings to suit your tastes. Breakfast Kale Salad is all the goodness of a breakfast sandwich without the bread. Instead, it’s all piled into a big, beautiful bowl. You can make the recipes above as-written or use them as a jumping-off point to build your own ideal bowl of grits. This grits bowl is almost like a deconstructed breakfast sandwich. 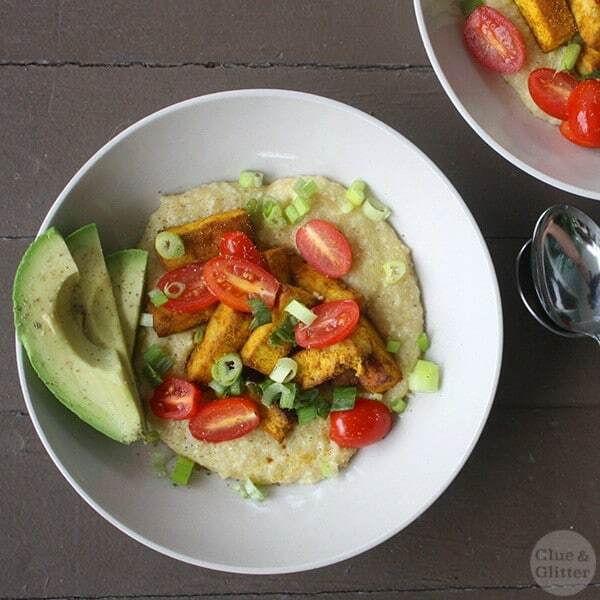 Eggy baked tofu, fresh avocado, and creamy, steamy grits. Pile your favorite breakfast foods between two slices of toast, bagel, english muffin, or a biscuit, and you are brunching properly. 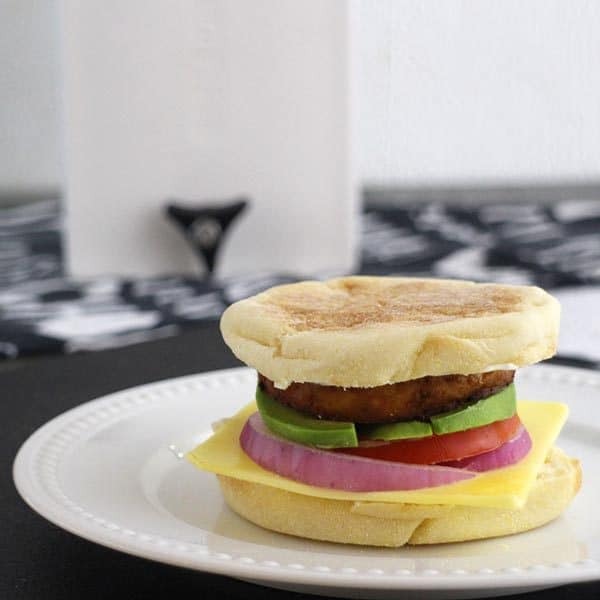 This super simple vegan breakfast sandwich stars a marinated tofu “egg” and fresh sliced avocado on an English muffin. Make the tofu in the oven or your air fryer! Try Churro French Toast or this stellar Vanilla French Toast with Strawberry Sauce. 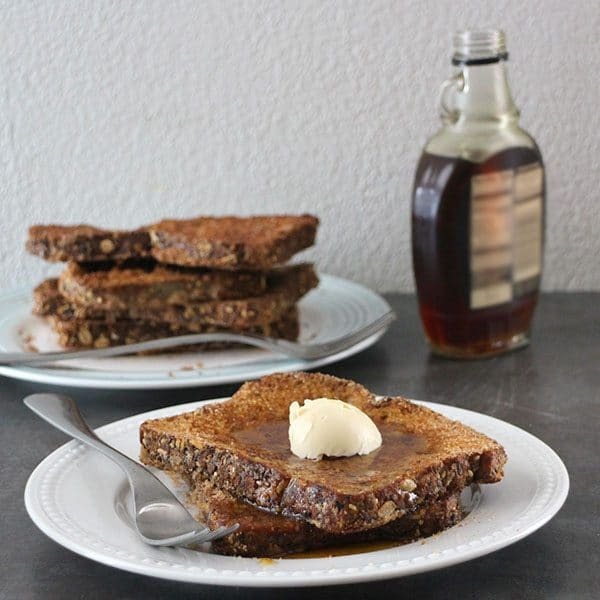 Churro French Toast has all of the cinnamon sweetness of a churro in a vegan French toast recipe that you can eat for breakfast! Is there anything that screams “BRUNCH!” like a big ol’ pile of fluffy, vegan pancakes? There are SO many ways to make a pancake without eggs or dairy. We are big fans of these Flourless Vegan Pancakes. I have found that the batter needs a bit more vegan milk than the recipe calls for, especially if you double or triple the recipe to feed a family. Just stir in more vegan milk until you reach a pourable, pancake batter consistency. If you want to get fancy, check out Michelle’s Gluten-Free Vegan Carrot Cake Pancakes. Carrot cake for breakfast? Yes, please!